Maybe here. 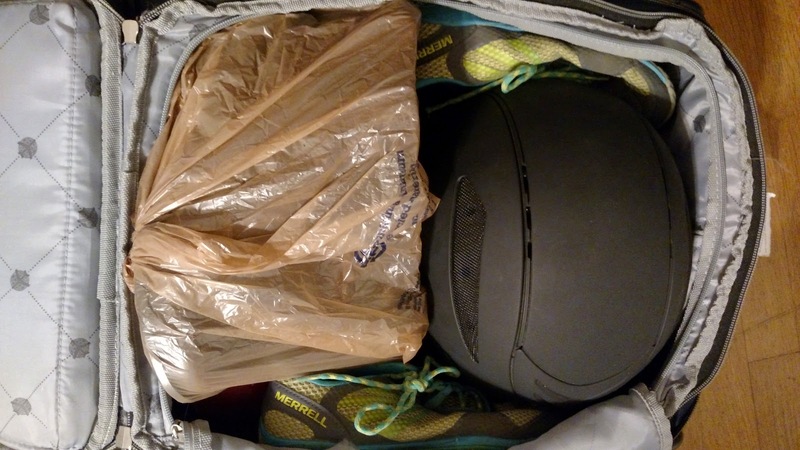 It's really hard to pack for a formal dinner, a CrossFit workout, and riding when you're flying! My husband's new company has a Christmas party in Austin, Texas every year, and it's a huge thing. They fly all the spouses and employees down for the weekend, have a company meeting (They have no home office, so it's the only time the employees are together) and throw a massive party - complete with a cocktail hour, 4 course meal, an after party, and an after-after party, all on their dime. It's sort of a thank you to the spouses for dealing with their significant others being gone all the time, and a good time to meet everyone. I look tired because this was taken at 3:00am! Nick's meeting lasted all day Saturday, so I met up with JenJ and Lauren, and I am so glad I did! We started with delicious brunch and great conversation - it felt like we could have talked forever despite that being the first time we met. 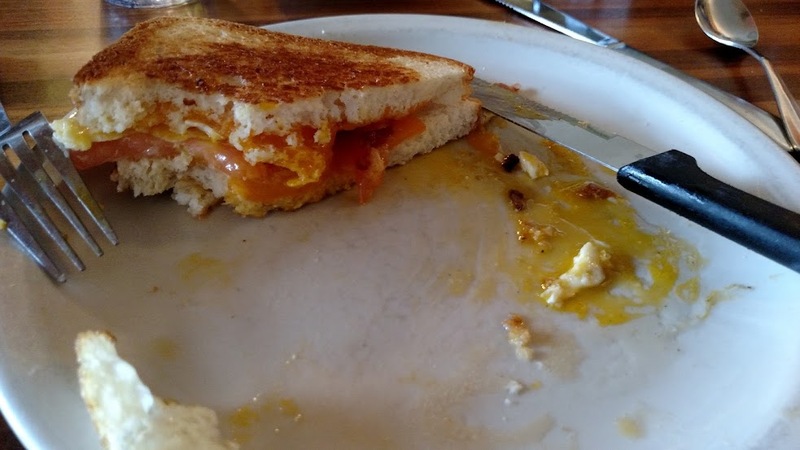 This breakfast panino at Kerbey Lane Cafe was GLUTEN FREE! Austin is awesome for people with food allergies. Then we headed over to the Dover store, where I walked around touching things, even though I couldn't buy anything since I was flying. 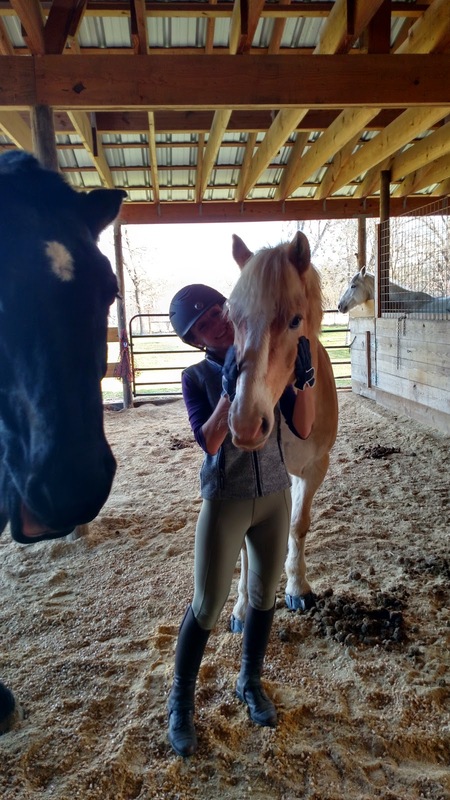 For someone with no local tack store, being able to touch things is inordinately exciting. My all-time favorite picture of Brego. The first thing I said when I saw him standing in the pasture was "Oh my gosh Brego's huge!" because he's so physically imposing in real life, it caught me off-guard. I thought Jen was joking when she said none of the halters at Dover fit him, but his head is seriously half as long as I am tall. There are almost no words for how big and adorable those ears are in real life! 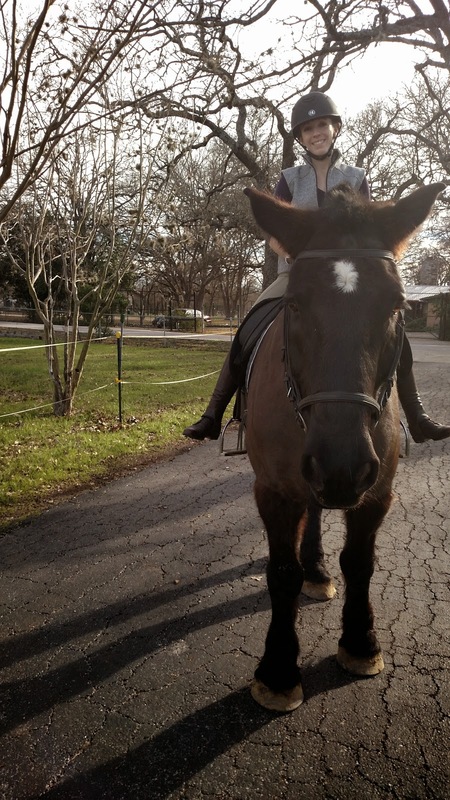 But he was so much fun, and I am still amazed that I got to ride him. 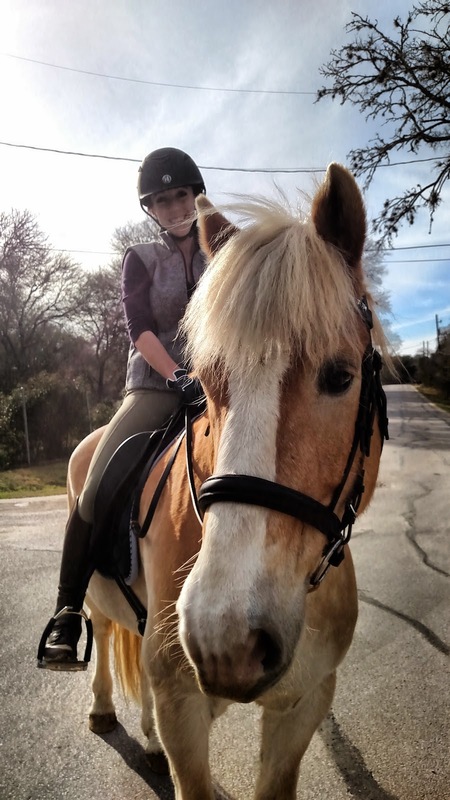 I have to say, I ride a cute horse. 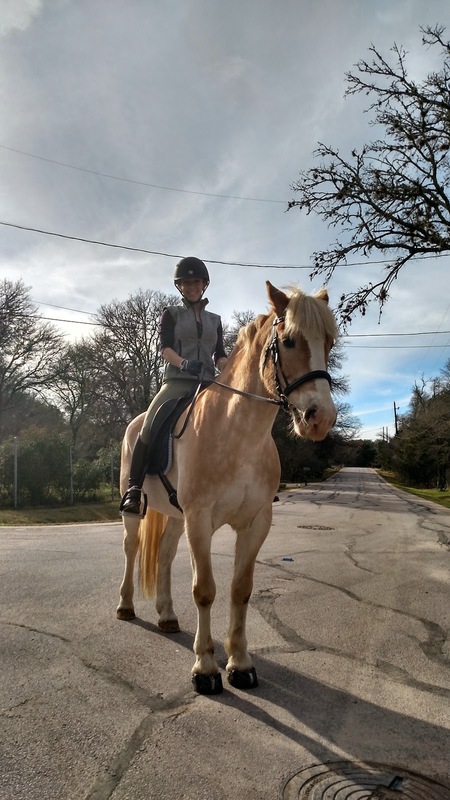 One that gets mistaken for a Haflinger constantly. But Paddy brings cute to a whole other level. Everything he does is cute. There's no other way to describe it. He's horse-sized, but every move he makes is just completely adorable, and I think he knows it. Two very, very good horses! Sadly, I had to get back to the hotel all too soon, so the visit didn't feel long enough. I am so thrilled to have met Jen and Lauren, as well as Paddy and Brego, and I'm excited to see them again next month for Blogger Weekend. So jealous! Those two are my top favorite blog horses! 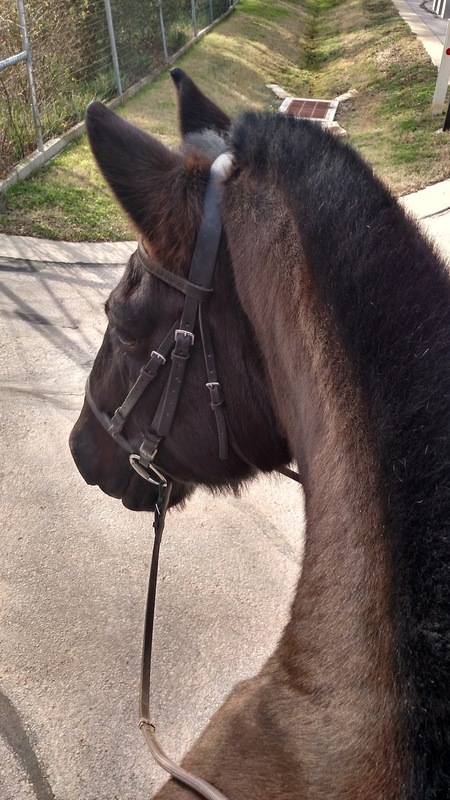 Brego does have the biggest head I've ever seen on a horse. And his lips... your whole hand ends up in his mouth when you give him a treat. You are not kidding. I got to experience that too. I think he can't help it, with a mouth that big. Hehehe. If you like beards, I should let Connor's grow out for you sometime. It gets to be 3-4 inches long below his jawline. OMG! 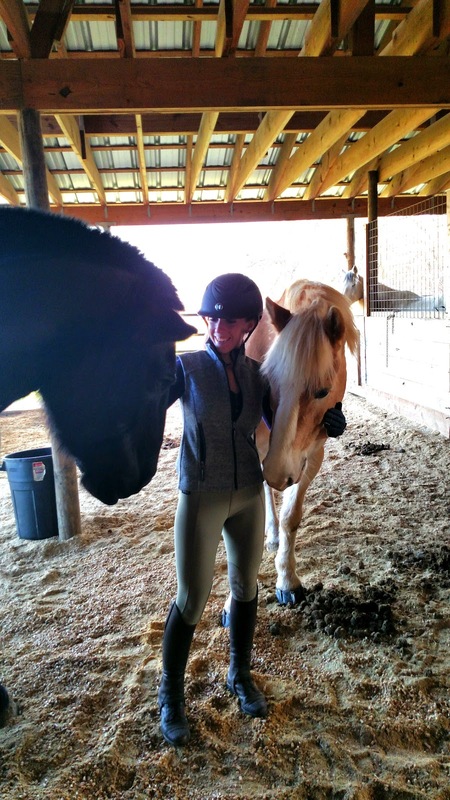 You are so lucky - those are two polar extremes of equine cutitude. Oh my god, Brego is a dinosaur! Hehe dinosaur. He is something very different, that is for sure. In a good way. It was awesome! I'm glad I get to repeat it soon - especially the warm weather in January, of course. I'm glad, me too! It was nice to meet them (and you! ), but next time I need to venture out to Simon too! Not to make you even jealouser, but oh man, you should be. Those ladies are awesome IRL! And the horses. So jealous it's not even right. It is an experience deserving of the jealousy! Holy horse. I'm actually not familiar with that blog, so I'll have to go check it out! It is an awesome blog. She doesn't post anymore, but you can go back and read what she wrote when she was posting. She and Brego were awesome together. OMG Brego is HUGE! I loved that blog when she used to post. Glad to see he is well. What a cool weekend! He IS! Pictures just do not do it justice! Wow - Brego has an enormous head!!!!! He is really cute, though, and so is Paddy. 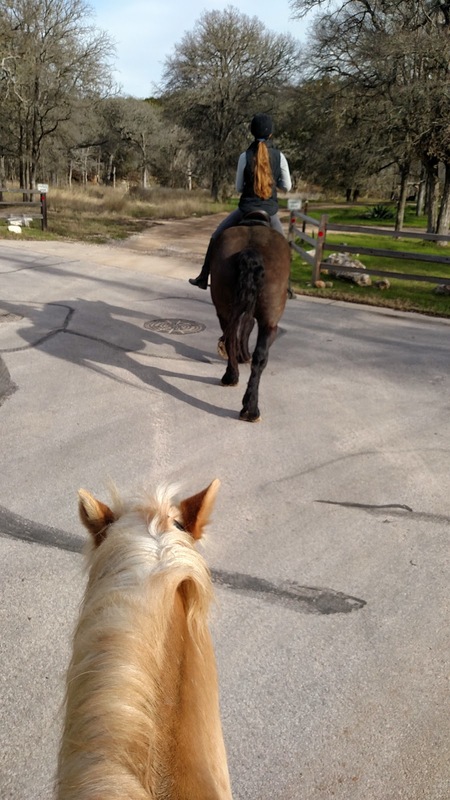 I also like the smaller horses - I am small myself. I love the last photo. Glad you had a good weekend! He does! 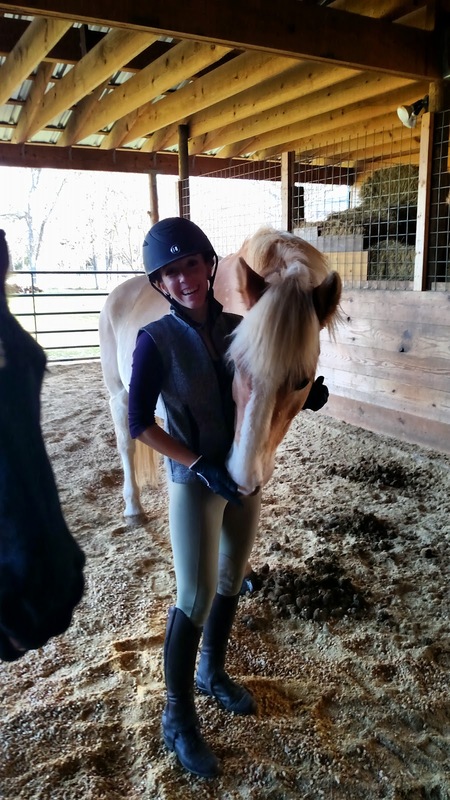 Yes, it was fun to ride him, but I like the smaller ones too. 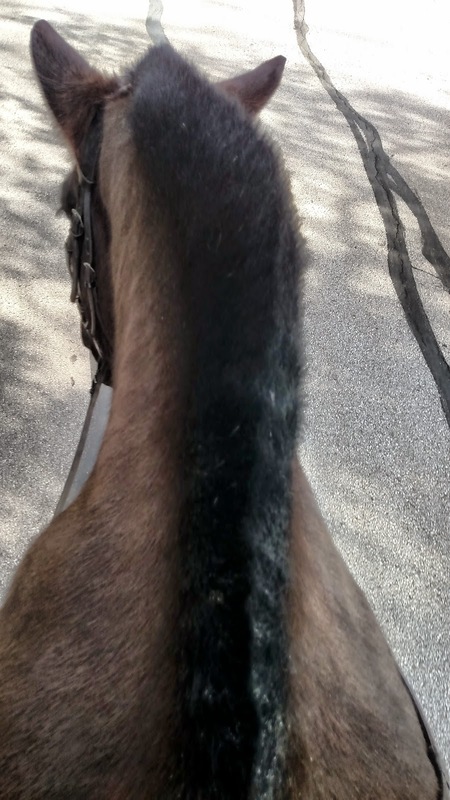 It felt strange to be back on Connor after that ride. Thanks! 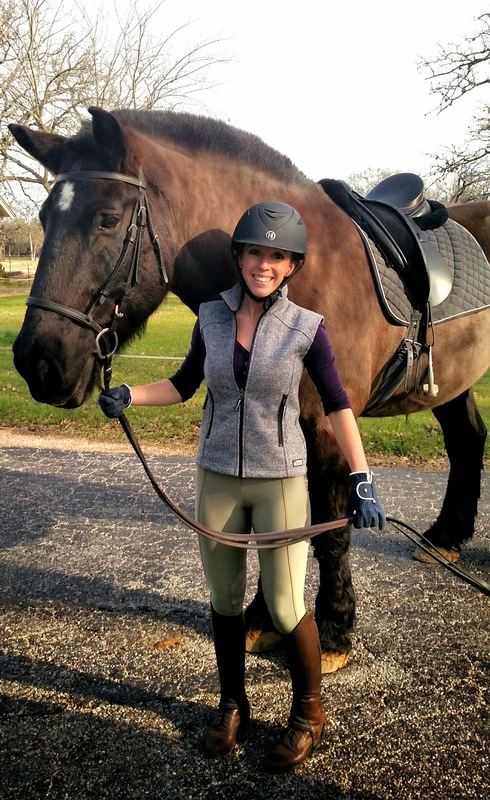 Love seeing you on a giant horse :) Sounds like a fantastic weekend! So fun! Too bad we missed each other by like.. a week! so fun...so jealoushe of all the blogger meet ups!